This year, get your July 4th started with an experience like no other as you party into the Fourth. Get on board our Chicago party cruise setting sail this July 3rd and get ready to Rock the Yacht! This pre-July 4th celebration is going to take you and your friends on an adventure through the city as you celebrate the Fourth with us. Set sail through the city aboard the beautiful Spirit of Chicago yacht and party with your friends on Lake Michigan. Get ready to start off your July 4th the right way and check out the night that you’ll be enjoying with us! Get aboard the Spirit of Chicago and take in the views of the Windy City like you’ve never experienced. This Chicago party cruise has three climate-controlled interior decks with panoramic windows for you to enjoy the sights. Take in the views from inside the yacht or head on out to the outer observation decks. Sail through Chi-Town and fill your eyes with the city skyline and all of its great landmarks. While you enjoy the views on this pre-July 4th celebration, we will have a live DJ on board spinning your favorite tracks of the year. Party your way into July 4th with your favorite Top 40, Hip-Hop, Pop, and Dance tracks as you sail through Chicago. Move your body aboard the Spirit of Chicago to your favorite songs of the year and dance the night away on the Spirit of Chicago’s dance floor! Now, how could you celebrate July 4th without some drinks? This Chicago party cruise will have fully stocked cash bars on board pouring up drinks all night long. Order up your favorites as you sail and enjoy drinks with your friends. Get your July 4th started the right way and book your tickets aboard the Spirit of Chicago today! 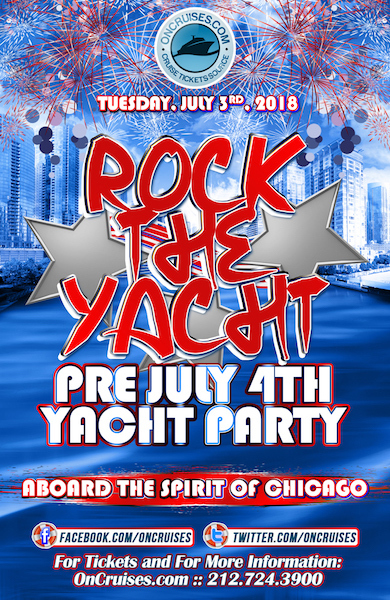 Rock the Yacht with us on our Chicago party cruise and get July 4th started on the seas.